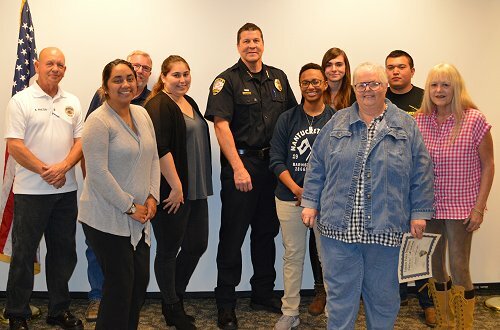 The Citizens’ Academy began in 1997 and was created to develop a strong partnership between community members and Lemoore Police Department. Through the Academy, our police department is truly open to the community, and increased trust and understanding become possible through openness and education. The Academy allows participants to experience conditions similar to the training officers receive and exposes participants to the daily operational duties of police officers. The Citizens’ Academy is taught by Police Department members, each highlighting their individual area of expertise. During the 7 week academy, citizens learn about officer survival, crime scene investigation, DUI enforcement, use-of-force issues, records and dispatch, as well as narcotics and surveillance. Academy members ride along in a patrol car at least once to experience firsthand the activities police officers routinely are exposed to and how they handle each situation. There is no cost to the citizen to attend the academy, just a commitment to attend all required classes. The Lemoore Police Department Citizens’ academies are open to the general public. For more information about the Citizens’ Academy, please call (559) 924-9574 or (559) 925-6877. Applications can be types or printed clearly. Please print it out and mail or carry it in to the Lemoore Police Department, 657 Fox St, Lemoore, CA 93245.